As August approaches, imprinted longing for meteors follow. Youthful recollections ebb and flow, the one constant is Perseid. These were the stars I wished upon, my source of wonder, the reason I gazed at night’s sky. 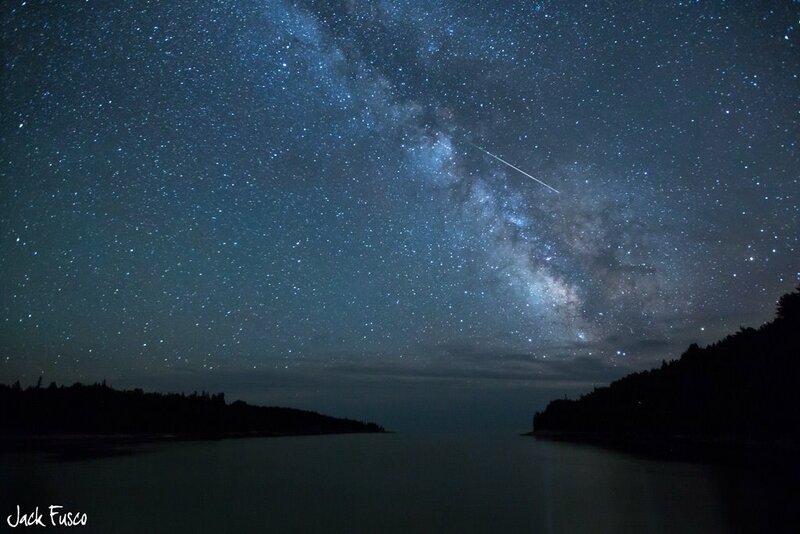 Perseid lent perspective to questions I hadn’t asked, cementing the essence of who I became. Effortless memory presses damp grass against my back, heart beating to the pulse of cricket song. Swaddled in darkness, even the wind waits for Perseid. Every year between July 17 and August 24, Earth crosses the orbital path of Comet Swift-Tuttle. Swift-Tuttle has a wonky oblong orbit, completing one orbit around the sun every 133 years. during those years ST travels from beyond Pluto to inside Earth’s orbit. Whenever ST crosses the inner solar system heat from our sun “melts” comet ice adding cosmic debris to ST’s tail. Little break away pieces, most no larger than grains of sand slam Earth’s upper atmosphere at 210,000 kilometers an hour – the Perseids have arrived. This year the Perseids peak August 11-13. Early northern hemisphere evening finds radiant Perseus low on the horizon, if you’re lucky a rare “Earthgrazer”might forge a horizontal blaze across the horizon. As evening becomes night the radiant point rises, Perseid abandons rehearsal for the main event. Perseid’s tantalizing sets play through the night – from midnight till first light’s encore, expect 50-100 meteors an hour. This year, a waning crescent moon won’t come up until just before sunrise, setting a dark stage for Perseid glory. 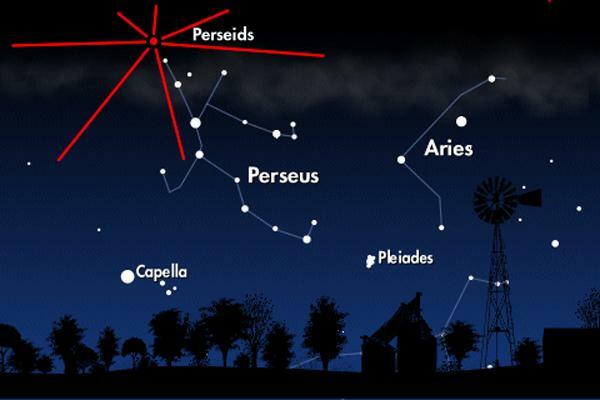 It doesn’t matter if radiant Perseus eludes you, Perseids knock loudly. Noted for being exceptionally fast and bright, their ionized gas trails often hang in the sky for wondrous moments. Dismiss concentrating on specific direction – find a dark place, lay back and open your eyes to the cosmos. Perseid will find you. A few minutes ago I stepped outside for a whiff of air, apparently on cue. Closing the door the exact moment a magnificent fireball split night’s horizon. Not some timid falling star – a full on cosmic slap, complete with adrenalin rush, racing pulse and heightened senses. Night had my undivided attention. I get goosebumps thinking about it – one of those inexplicable portraits, indelibly etched in conscience for all eternity. It’s entirely possible I danced a jig while chanting “hail Perseid” in my head. 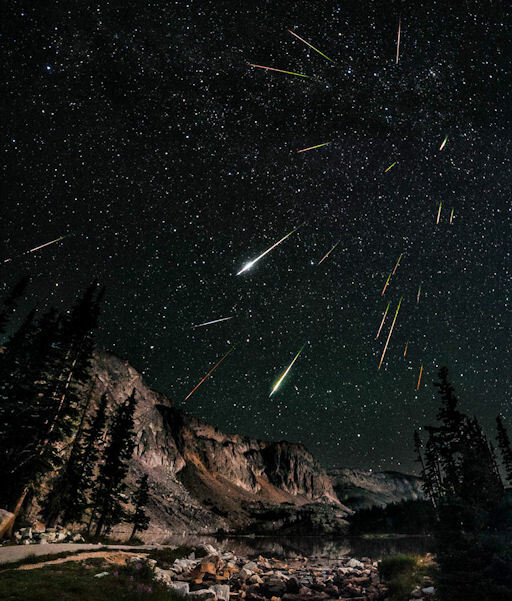 August brings the annual Perseid meteor shower – dependable and prolific, the source of countless childhood wishes. Peaking on August 12, debris from comet Swift-Tuttle has competition this year. Reaching a zenith two days after a “super moon”, (14% bigger and 30% brighter than average full moons) light pollution plans to give Perseid a run for the money. Linked below are tips from earthsky to maximize viewing…. All I ask is to open your night eyes the next few days. Promise me – if Perseid smacks your head – dance an impromptu jig while chanting hail Perseid. Perseids peak tonight. Perhaps you were able to ponder their magic, and want more, or sadly missed out and want some. Either way, Perseid is not the only show in town. Its well known because it occurs in summer, and has an impressive number of meteors per hour. The Quadrantids, January 1 – 6, peaking on the 3 and 4th is the most prolific, based on meteors per hour at the peak. They originate from a comet recently named 2003EH1, and boast 10 more meteors per hour than Perseid. April 19 – 24, brings the Lyrids, from Comet Thatcher, they peak on the 22nd with a paltry 12 an hour. May 1 – 8 is the Eta-Aquards, appearing from the constellation Aquarius, courtesy Halley’s Comet. They peak May 5 – 6 at 45 per hour. June Lyrids are from the 10 – 21, you might hardly notice them with 9 per hour. their source is not known. July 15 – August 15 is the Southern Delta Aquarids. Coming from Aquarius near the star Delta, they peak July 28 – 29 at 19 per hour. Oct. 16 – 26 the Orionids, peaking on the 21st at 25 per hour. Nov. 4 – 7 the Taurids from Comet Encke, 8 per hour. Nov. 15 – 19 is the Leonids, appearing from constellation Leo, courtesy Temple-Tuttle Comet, about 10 per hour. Dec. 7 – 15 the Geminids peaking on the 13 – 14th with a substantial 80 an hour. This shower is the only one resulting from asteroid debris. Finally the Ursids, Dec. 17 – 24, from Comet Tuttle, with 9 an hour….